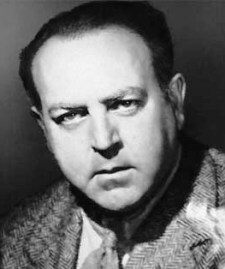 In the early forties, Russian-American film producer Val Lewton was head of horror production at RKO Studios. In a precise agreement with the studio, for each film he was given a strictly limited budget, a title and instructions to keep the running time short. With these basic elements, an efficient and effective cast and crew for each production, and his own talent for scriptwriting, he made a series of viscerally chilling films, in a distinctly shadowy style, that would become horror classics. In a pair of double feature DVDs, four of Lewton's classic chillers are now available from Warner Archive. 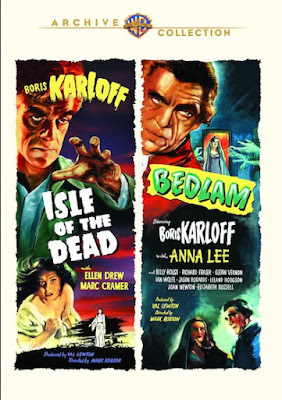 One disc features Boris Karloff in two of the three films he made for the producer: Isle of the Dead (1945) and Bedlam (1946). 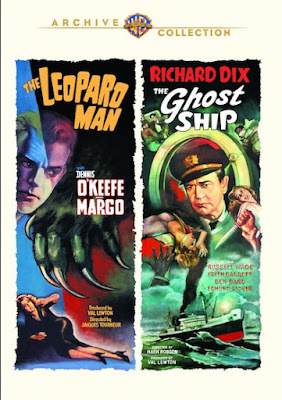 The other showcases stars Dennis O'Keefe and Richard Dix in The Leopard Man and The Ghost Ship (both 1943) respectively. The future director of plush productions like Peyton Place (1957) and Valley of the Dolls (1967), Mark Robson would show a flair for horror with this pair of Karloff flicks. Isle of the Dead and Bedlam are two of five films the director would make for Lewton (the others: horror flicks Ghost Ship and The Seventh Victim , and the drama Youth Runs Wild ). Both movies are notable among Lewton's productions for building horror with more disturbing than creepy content. 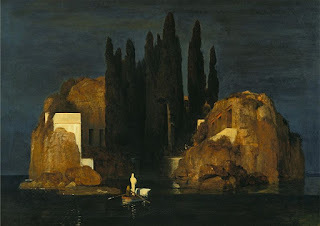 Here the fear isn't so much of what is hiding in the dark, but human nature. Isle of the Dead takes a while to build momentum. Like the static world in that work of art, it maintains a feel of lingering dread, but it takes much of the film's running time to escalate to anything truly compelling. It almost plays out like a stage production, its characters quarantined in a house on an island infested with the plague, afraid of the real threat of death, but also wary of local legends. 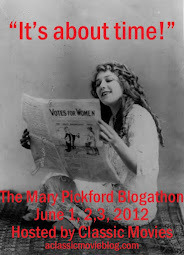 There is a pay-off though, with a truly terrifying final sequence that descends into palpable confusion and madness. While Karloff is a dominating presence in Bedlam, it is also a remarkable showcase for Anna Lee. The actress rarely had the chance to dig into a role as meaty as this 18th century tale of a woman accustomed to living among the rich, as a sort of jester for prominent men, who is inspired by a Quaker to fight for improved conditions in a local insane asylum. Karloff is the cruel overseer of the institution in which inmates are treated like animals and brought out for parties to be mocked by the upper classes. Through Karloff's machinations, Lee is wrongly committed to the asylum and there she finds strength in the sort of feminine traits typically mocked as weak by men. Though horrified and unsettled by the inmates, she relies on the wit that has given her a plush life to keep her own sanity. She finds herself capable of disturbing behavior herself, the sort of dark impulses that provide the true horror in this unusual film. While the dangerous men in The Leopard Man and The Ghost Ship are as gripped by the dark side of human nature as Karloff, these films present those impulses more firmly in the threatening, shadowy world that formed Lewton's unique style. The Leopard Man would be the last of three horror films Jacques Tourneur directed for Lewton. He was as responsible as the producer for the feeling of fearful anticipation that would characterize these RKO productions. Like his previous efforts Cat People (1942) and I Walked With a Zombie (1943), it draws its chills from dangers lurking in the darkness; its most terrible moments drawn from something as simple as the fear of a sheet of pure, black night, with just enough light to show the fear on the face of whoever must enter that void to reach safety. There's a feeling of doom chasing the residents of a small New Mexican town, where an escaped leopard used for a nightclub publicity stunt seems to be killing women who walk the streets alone late at night. Voices, sounds and the swish of tree branches increase the feeling of being alone and doomed. A gush of blood oozing from beneath a doorway simply and efficiently communicates the horror of what is happening on the other side. The Ghost Ship approaches that terror of isolation in a different way, leaving a man feeling alone among a crew of many because they can't see as he can how dangerous their obedience-obsessed captain has become. As played by Richard Dix, the unhinged seaman leads with icy calm, sending his men to doom simply to test his own powers and satisfy his need for revenge over anyone who defies him. The ship feels like a haunted house, empty, shadowy and with the feeling of being filled with dark spirits that possess the captain and his men. Special features include commentary by director William Friedkin on The Leopard Man and a trailer for the film.